When do we meet?... Friday evening's from 7:30 p.m. to 9 p.m. in St Aidan's Church Hall. What do we do?... We have a demonstration one week and a workshop the following week. The demonstration usually consists of three arrangements of different designs, which are all put in a raffle at the end of the evening. For the workshop meeting members bring their own flowers and container, and copy one of the designs done the previous week by the demonstrator, with her guidance. If there is a wedding the following day and flowers are requested for church, members may assist with floral arrangements, depending upon what is required. Sometimes there will be a display on a particular theme, for example using one word and asking members to do an interpretive arrangement. It is quite surprising to see the different ideas that appear. At Christmas the church has many arrangements, done by the members, and with other help as well. All the window sills are decorated (there are five sills on very high windows and five lower down) with greenery and candles, ready for the candle-lit Carol service on the Sunday before Christmas. Who does what?... 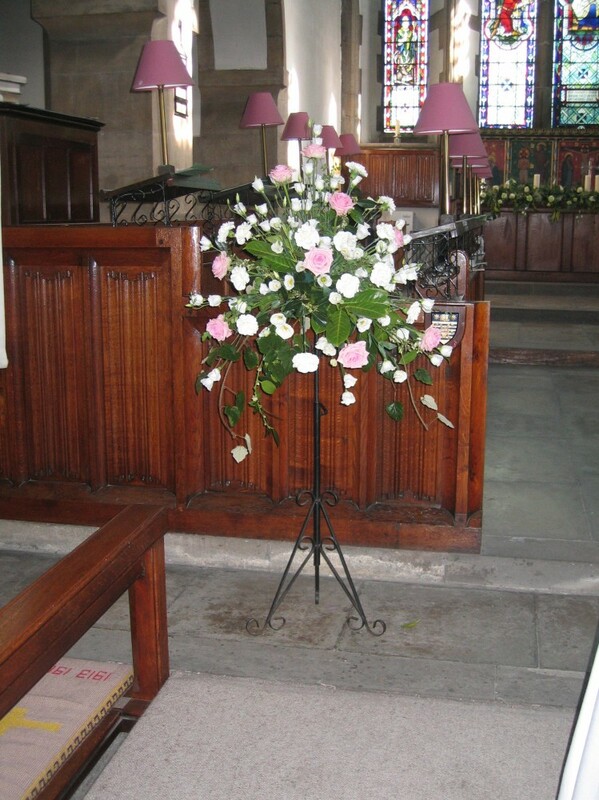 The person taking the class is experienced to NAFAS (National Association of Flower Arrangers) standard and does arrangements based on particular themes, with variations. The arranger’s assistant is affectionately known as ‘Hyacinth Bucket’ because of her "ology" in making coffee and tea. Her other expertise is in bookkeeping, so she keeps the financial records as well. What does it cost?... £1 donation on each demonstration eveing , inclusive of coffee or tea and a raffle, and 50p on workshop evenings. Materials for workshops are available if required, e.g. oasis, florists tape, wires, "sticky stuff" etc., at a small charge. How many attend?... At present we have approximately 20 members, and new members are always welcome, either to take part or just to watch. Help and guidance is given for beginners, and there are new ideas for more experienced arrangers. The number attending varies because of work schedules etc., for those working shifts or irregular hours, holidays etc.